To understand the proof, you’ll need to know some algebra and the basics of modular arithmetic. The order of 5 mod 2m is a power of two. This constrains the values for the order so that only expressions of the form 52n – 1 need be considered. 52n – 1 can be factored to isolate its factors of two. This is my key insight, made possible by recursive factoring of differences of squares. 52n – 1 is divisible by 2n+2. This shows that the order of 5 mod 2n+2 is 2n, or equivalently, that the order of 5 mod 2m is 2m-2. In addition, I show that the powers of five mod 2m cycle starting at 50; this is important because it will show that the cycle mod 10m always starts after the cycle mod 2m. The order of a mod b is related to , so let’s start there. is Euler’s phi function, the number of positive integers less than or equal to b that are relatively prime to b (for b a power of two, this is just the count of the odd numbers less than b). We want to compute , which we can do with this simple formula: . For p=2, this gives = 2m-1. The order of a mod b must divide , so the order of the powers of five mod 2m must divide , or 2m-1. In other words, the order must be a power of two — a power of two less than or equal to 2m-1 to be specific — because the divisors of a positive power of two are all the positive powers of two less than or equal to it. Let 2e represent any of the candidates for the order of 5 mod 2m: 1, 2, 4, 8, … , 2m-2, 2m-1. By definition, if the order is 2e, , or equivalently, . That is, 52e – 1 is divisible by 2m. Now all we have to do is figure out which e makes this true. Combining these recursively you get 516 – 1 = 4(51 + 1)(52 + 1)(54 + 1)(58 + 1). This generalizes to 52n – 1 = 4(51 + 1)(52 + 1)(54 + 1)···(52n/2 + 1). There is a factor of two in each 52f + 1, as I’ll show in the next section. 52f + 1 is divisible by 2. Every positive power of five ends in 5, so it is odd. This means 52f + 1 is even, meaning it’s divisible by 2. 52f + 1 is not divisible by any power of two greater than 2. To show this, it suffices to show that 52f + 1 is not divisible by 4. If it’s not divisible by 4, it’s not divisible by any higher power of two (because the divisors of a positive power of two are all positive powers of two less than or equal to it). So if 22 is not a factor, 2s, s > 1, is not a factor. 520 + 1. 51 + 1 = 6, which obviously is not divisible by 4. 52f + 1, f ≥ 1. 52f ends in 25, so 52f + 1 ends in 26. An integer is divisible by 4 if and only if its last two digits are divisible by 4. Since 26 is not divisible by 4, neither is 52f + 1. So the example expression 4(51 + 1)(52 + 1)(54 + 1)(58 + 1) has a factor of 26: 22 times four factors of 2. This generalizes to show that 52n – 1 is divisible by 2n+2. Recasting this from the perspective of the power of five to the modulus, let’s substitute m-2 for n. This gives the equivalent statement 52m-2 – 1 is divisible by 2m. Just to be explicit, this implies that no 52e, e < 2m-2, is divisible by 2m. So, the candidate power of two we were seeking is 2m-2, the order of 5 mod 2m. Let the period p = 2m-2. As we proved above, . We also know, trivially, that . The difference between the exponents p and 0 is p, showing a full cycle occurs starting at 50. The period mod 2m is a cycle mod 10m. The cycle mod 10m is the period mod 2m. The first half only shows that the period mod 2m is a multiple of the period mod 10m. The second half shows that the period mod 10m is in fact the same as the period mod 2m. I’ll use the variable p for the period mod 2m, as above, to simplify the notation in the proof that follows. For i ≥ 0, what we’ve shown is that . That is, powers of five with exponents a period apart are congruent mod 2m. Congruence mod 2m means that 5i+p – 5i is a multiple of 2m; that is, 5i+p – 5i = n·2m, for some nonnegative integer n.
Factoring out 5i we get 5i(5p – 1) = n·2m. When i≥m, n is a multiple of 5m, so n = n’·5m. 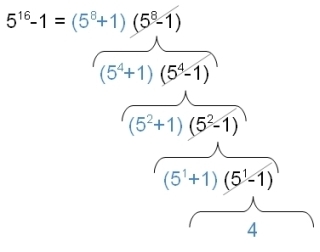 Substituting n’·5m for n we get 5i(5p – 1) = n’·5m2m = n’·10m. 5i(5p – 1) = 5i+p – 5i = n’·10m. This shows that for i≥m, , so p is a cycle mod 10m. We’ve shown that p is a cycle mod 10m, but not that p is the period mod 10m. In other words, it’s possible the period mod 10m is less than p — we have to show it isn’t. 5i+p – 5i = n·10m = n·5m2m = (n·5m)2m. This shows that for i≥m, , so p is the period mod 2m and mod 10m. This section is not part of the proof, but it shows some PARI/GP calculations that support it. Part 2 of the proof is identical to part 2 of the proof in my article “Cycle Length of Powers of Two Mod Powers of Ten”, except that 5 and 2 are interchanged. Part 1 is quite different though. I could not use the same approach, since powers of two beyond four don’t have primitive roots. Coming up with an alternate approach took some time. I had the elements of it early on: knowing that the order must be a power of two, knowing how to factor differences of squares, and knowing that each factor was even. But I was missing the piece that let me show each factor had exactly one factor of two — until I realized I could apply the divisibility by four test. The binary structure of powers of a number computed mod powers of two make this approach possible (it should work for powers of any odd number, although it may be more difficult to show the factors of two). To prove the period formula for the positive powers of five mod powers of ten, I first proved it for mod powers of two. I showed that the period must be a power of two, and derived an expression that showed which power of two. I then showed that the period mod powers of two and mod powers of ten must be the same, after a certain starting point. I’ve previously shown a connection between the positive powers of five and negative powers of two; now I’ve shown a connection between the positive powers of five and the positive powers of two. Hey, could I use this? — with credit given of course. I would be using it to prove something about the powers of 5, and this could come in handy. my work is still in process, but you can check it out on the blog that i gave as website. I will use you as a source and also print your proof there too, but in my words. unless you tell me otherwise. I will still link this page and also mention your name. Yes. Thanks for your interest. I look forward to your blog post.